If you love the outdoors and want to make a positive difference for kids, Camp Sealth may be the place for you! We’re a friendly, inclusive community of campers and staff, accredited by the American Camp Association, and passionate about helping kids become caring, responsible individuals. Working at a summer camp is hard work, but it’s worth the effort. You’ll leave camp with great memories, new skills, and a ton of new best friends. A summer at camp is truly an experience you’ll never forget! Summer staff must be at least 17 years old by July 1, able to commit the entire summer (June 17 to August 29), and have a clean background and favorable references. In addition, camp staff must be caring, compassionate, and enjoy working with kids. If you are not quite old enough for a staff position, consider applying for one of our Teen Leadership programs. Available positions include cabin counselors, activity instructors, leadership staff, and support roles including kitchen staff and health care. Salary range is $200 to $400 per week for the entire season, depending on position and qualifications. Room and board is included for all positions. Before you apply, please read the summer Employment Guide. You may also want to check out the Overnight Camp section of the website to learn more about camp activities, structure, etc. If you have questions about staff positions or to check availability of jobs, contact us at 206 463 3174 ext. 35 or campstaff@campfireseattle.org. Each summer, Sealth hires 10-15 international staff from around the world. If you are international and wish to pursue employment at Camp Sealth, you must go through an agency to procure a J-1 visa. You must be at least 18 years old to qualify for a J-1 visa. 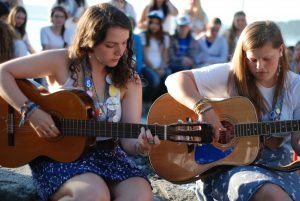 Although there are many agencies that you can apply through, Sealth works primarily with Camp Leaders and Camp America. 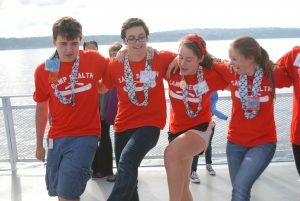 Sealth recruits volunteers for only a few positions: Health Care and High School LEADs (for teens). Please read the Employment Guide for more information or contact us at (206) 463-3174 ext. 35. Learn about opportunities to work at Camp Sealth in the Spring and Fall for Environmental Education program, as well as internship opportunities or other part-time or seasonal work outside of the summer. Log in to your UltraCamp account to access forms and information that you need. If you don’t have an UltraCamp account yet, click here to create an account.